Cecily Perkins started her equestrian career at the age of 11 when she politely asked her neighbor if she could ride her horses. From those early backyard experiences, she moved up to formal riding lessons with Dorothy Miller, the owner of Via Verde Equestrian Center in Covina, CA. Cecily was a natural and by the time she was 14, she had graduated to an Assistant Trainer position under Dorothy. With her feet firmly planted in the management of school horse and lesson programs, she was well on her way to becoming the well-rounded professional horsewoman she is today. Cecily became friends with a local veterinarian, Dr. Michael Gerry who stabled his horses at Via Verde and competed in dressage up to the Grand Prix level. Dr. Gerry mentored Cecily, introducing her to and encouraging her to ride with top level clinicians such as Hilda Gurney and Jeff Moore. He also introduced her to his own riding mentor Franz Rochowansky. “Rocky” as he was known to his friends, was a classical dressage master and the Chief Rider at the Spanish Riding School during WWII and up until 1955. He became an integral component in Cecily’s understanding of horse training and forming her own style in the saddle. Rocky instilled in her the belief that well-rounded flatwork was an essential part of training, no matter the specific discipline. This became the foundation of her instruction for both horses and riders. Cecily continued to hone her equitation and jumping skills by attending clinics with George Morris, Joe Fargis, Bruce Davidson and Anne Kursinsky to name a few. Along the way, she put her younger sister Jenni on her first horse at 6 months old and continued her overseeing her personal equestrian education well into Jenni’s teenage years. Cecily also selected and trained several of Jenni’s earliest winning horses. Having a sharp eye for young talent, both horses and riders, allowed Cecily to expand her business into purchasing, training and selling horses as show-jumping prospects on the A-level circuit. 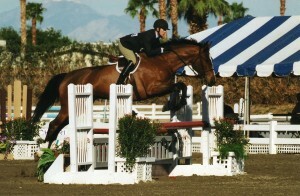 Cecily herself routinely showed horses for JME Enterprises at HITS in both Lake Tahoe, NV and Indio, CA. After moving her family and successful horse-training business to Oregon, Cecily not only continued bringing up the next generation of riders but expanded her talents into the areas of building and arena management. She consulted in the positioning, research, design, and construction of a 25 stall barn with an 80’ by 190’ covered arena. This included the drain system, base and all-weather footing for a 130’ by 300’ outdoor arena. All the while, she developed local youth and adult riding clubs, established the school horse/training/lesson program, hired an assistant trainer and promoted the facility. Cecily joined her sister Jenni and Team McAllister in 2016, bringing her wealth of talent and experience to their expanding program. She is joined by her daughter Kylie Perkins, whom she personally started in the saddle at the age of 5, just as she did with Jenni.